3.1 What is a syntax transformer? 4.1 Pattern variable vs. template—fight! 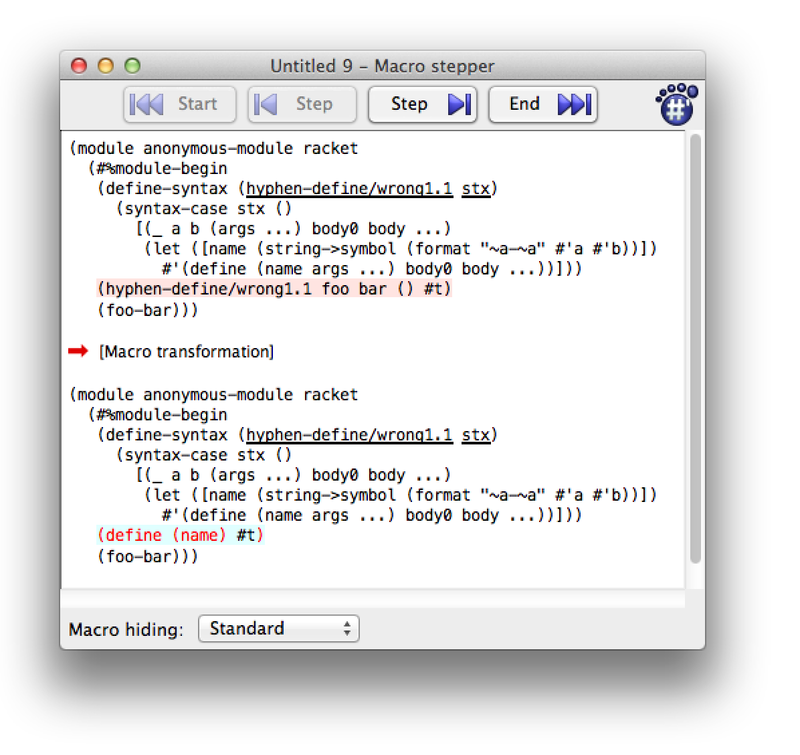 A practical guide to Racket macros. Copyright (c) 2012-2019 by Greg Hendershott. All rights reserved. Feedback and corrections are welcome here. "All the parentheses" was actually not a big deal. Instead, the first mind warp was functional programming. Before long I wrapped my brain around it, and went on to become comfortable and effective with many other aspects and features of Racket. I found that simple macros were easy and understandable, plus there were many good tutorials available. But the moment I stepped past routine pattern-matching, I kind of fell off a cliff into a terminology soup. I marinaded myself in material, hoping it would eventually sink in after enough re-readings. I even found myself using trial and error, rather than having a clear mental model what was going on. Gah. I’m starting to write this at the point where the shapes are slowly emerging from the fog. If you have any corrections, criticisms, complaints, or whatever, please let me know. Finally I do hope it may help other people who have a similar background and/or learning style as me. I want to show how Racket macro features have evolved as solutions to problems or annoyances. I learn more quickly and deeply when I discover the answer to a question I already have, or find the solution to a problem whose pain I already feel. Therefore I’ll give you the questions and problems first, so that you can better appreciate and understand the answers and solutions. The macro system you will mostly want to use for production-quality macros is called syntax-parse. And don’t worry, we’ll get to that soon. But if we start there, you’re likely to feel overwhelmed by concepts and terminology, and get very confused. I did. 1. Instead let’s start with the basics: A syntax object and a function to change it—a "transformer". We’ll work at that level for awhile to get comfortable and to de-mythologize this whole macro business. 2. Soon we’ll realize that pattern-matching would make life easier. We’ll learn about syntax-case and its shorthand cousin, define-syntax-rule. We’ll discover we can get confused if we want to munge pattern variables before sticking them back in the template, and learn how to do that. 4. Finally, we’ll realize that our macros could be smarter when they’re used in error. Normal Racket functions optionally can have contracts and types. These catch usage mistakes and provide clear, useful error messages. It would be great if there were something similar for macro. There is. One of the more-recent Racket macro enhancements is syntax-parse. YOU ARE INSIDE A ROOM. THERE ARE KEYS ON THE GROUND. A syntax transformer is not one of the トランスフォーマ transformers. Instead, it is simply a function. The function takes syntax and returns syntax. It transforms syntax. These examples assume #lang racket. If you want to try them using #lang racket/base, you’ll need to (require (for-syntax racket/base)). When we use define-syntax, we’re making a transformer binding. This tells the Racket compiler, "Whenever you encounter a chunk of syntax starting with foo, please give it to my transformer function, and replace it with the syntax I give back to you." So Racket will give anything that looks like (foo ...) to our function, and we can return new syntax to use instead. Much like a search-and-replace. That shorthand lets you avoid typing lambda and some parentheses. What we want to remember is that this is simply shorthand. We are still defining a transformer function, which takes syntax and returns syntax. Everything we do with macros, will be built on top of this basic idea. It’s not magic. #' is short for syntax much like ' is short for quote. "I am also foo, using #' instead of syntax"
We’ll use the #' shorthand from now on. Of course, we can emit syntax that is more interesting than a string literal. How about returning (displayln "hi")? When Racket expands our program, it sees the occurrence of (say-hi), and sees it has a transformer function for that. It calls our function with the old syntax, and we return the new syntax, which is used to evaluate and run our program. Our examples so far have ignored the input syntax and output some fixed syntax. But typically we will want to transform the input syntax into something else. The (print stx) shows what our transformer is given: a syntax object. A syntax object consists of several things. The first part is the S-expression representing the code, such as '(+ 1 2). (syntax-source stx) is returning 'eval, only because of how I’m generating this documentation, using an evaluator to run code snippets in Scribble. Normally this would be something like "my-file.rkt". Each of those syntax objects could be converted by syntax-e, and so on recursively—which is what syntax->datum does. When we want to transform syntax, we’ll generally take the pieces we were given, maybe rearrange their order, perhaps change some of the pieces, and often introduce brand-new pieces. The values at the end of the example allows the result to evaluate nicely. Try (reverse-me "backwards" "am" "i") to see why it’s handy. Understand Yoda, we can. Great, but how does this work? The first argument of datum->syntax contains the lexical context information that we want to associate with the syntax outputted by the transformer. If the first argument is set to #f then no lexical context will be associated. Normal Racket code runs at ... run time. Duh. Instead of "compile time vs. run time", you may hear it described as "syntax phase vs. runtime phase". Same difference. But a syntax transformer is called by Racket as part of the process of parsing, expanding, and compiling our program. In other words, our syntax transformer function is evaluated at compile time. If we implemented if as a function, all of the arguments would be evaluated before being provided to the function. One answer is that functional programming is good, and side-effects are bad. But avoiding side-effects isn’t always practical. Oops. Because the expressions have a side-effect, it’s obvious that they are both evaluated. And that could be a problem—what if the side-effect includes deleting a file on disk? You wouldn’t want (if user-wants-file-deleted? (delete-file) (void)) to delete a file even when user-wants-file-deleted? is #f.
So this simply can’t work as a plain function. However a syntax transformer can rearrange the syntax – rewrite the code – at compile time. The pieces of syntax are moved around, but they aren’t actually evaluated until run time. So that works, but using cadddr etc. to destructure a list is painful and error-prone. Maybe you know Racket’s match? Using that would let us do pattern-matching. Notice that we don’t care about the first item in the syntax list. We didn’t take (car xs) in our-if-v2, and we didn’t use name when we used pattern-matching. In general, a syntax transformer won’t care about that, because it is the name of the transformer binding. In other words, a macro usually doesn’t care about its own name. Oops. It’s complaining that match isn’t defined. Our transformer function is working at compile time, not run time. And at compile time, only racket/base is required for you automatically—not the full racket. Anything beyond racket/base, we have to require ourselves—and require it for compile time using the for-syntax form of require. In this case, instead of using plain (require racket/match), we want (require (for-syntax racket/match))—the for-syntax part meaning, "for compile time". We used for-syntax to require the racket/match module because we needed to use match at compile time. What if we wanted to define our own helper function to be used by a macro? One way to do that is put it in another module, and require it using for-syntax, just like we did with the racket/match module. Syntax transformers work at compile time, not run time. The good news is this means we can do things like rearrange the pieces of syntax without evaluating them. We can implement forms like if that simply couldn’t work properly as run time functions. More good news is that there isn’t some special, weird language for writing syntax transformers. We can write these transformer functions using the Racket language we already know and love. The semi-bad news is that the familiarity can make it easy to forget that we’re not working at run time. Sometimes that’s important to remember. For example only racket/base is required for us automatically. If we need other modules, we have to require them, and do so for compile time using for-syntax. Similarly, if we want to define helper functions in the same file/module as the macros that use them, we need to wrap the definitions inside a begin-for-syntax form. Doing so makes them available at compile time. Most useful syntax transformers work by taking some input syntax, and rearranging the pieces into something else. As we saw, this is possible but tedious using list accessors such as cadddr. It’s more convenient and less error-prone to use match to do pattern-matching. Historically, syntax-case and syntax-rules pattern matching came first. match was added to Racket later. It turns out that pattern-matching was one of the first improvements to be added to the Racket macro system. It’s called syntax-case, and has a shorthand for simple situations called define-syntax-rule. Pretty similar, huh? The pattern matching part looks almost exactly the same. The way we specify the new syntax is simpler. We don’t need to do quasi-quoting and unquoting. We don’t need to use datum->syntax. Instead, we supply a "template", which uses variables from the pattern. Here’s the thing about define-syntax-rule. Because it’s so simple, define-syntax-rule is often the first thing people are taught about macros. But it’s almost deceptively simple. It looks so much like defining a normal run time function—yet it’s not. It’s working at compile time, not run time. Worse, the moment you want to do more than define-syntax-rule can handle, you can fall off a cliff into what feels like complicated and confusing territory. Hopefully, because we started with a basic syntax transformer, and worked up from that, we won’t have that problem. We can appreciate define-syntax-rule as a convenient shorthand, but not be scared of, or confused about, that for which it’s shorthand. Most of the materials I found for learning macros, including the Racket Guide, do a very good job explaining how patterns and templates work. So I won’t regurgitate that here. Sometimes, we need to go a step beyond the pattern and template. Let’s look at some examples, how we can get confused, and how to get it working. Let’s say we want to define a function with a hyphenated name, a-b, but we supply the a and b parts separately. The Racket struct macro does something like this: (struct foo (field1 field2)) automatically defines a number of functions whose names are variations on the name foo—such as foo-field1, foo-field2, foo?, and so on. So let’s pretend we’re doing something like that. We want to transform the syntax (hyphen-define a b (args) body) to the syntax (define (a-b args) body). Huh. We have no idea what this error message means. Well, let’s try to work it out. The "template" the error message refers to is the #'(define (name args ...) body0 body ...) portion. The let isn’t part of that template. It sounds like we can’t use a (or b) in the let part. Apparently our macro is defining a function with some name other than foo-bar. Huh. This is where the Macro Stepper in DrRacket is invaluable. Even if you prefer mostly to use Emacs, this is a situation where it’s definitely worth temporarily using DrRacket for its Macro Stepper. Our template is using the symbol name but we wanted its value, such as foo-bar in this use of our macro. Looks weird? Let’s take a deep breath. Normally our transformer function is given syntax by Racket, and we pass that syntax to syntax-case. But we can also create some syntax of our own, on the fly, and pass that to syntax-case. That’s all we’re doing here. The whole (datum->syntax ...) expression is syntax that we’re creating on the fly. We can give that to syntax-case, and match it using a pattern variable named name. Voila, we have a new pattern variable. We can use it in a template, and its value will go in the template. Instead of an additional, nested syntax-case, we could use with-syntaxAnother name for with-syntax could be, "with new pattern variable".. This rearranges the syntax-case to look more like a let statement—first the name, then the value. Also it’s more convenient if we need to define more than one pattern variable. Whether you use an additional syntax-case or use with-syntax, either way you are simply defining additional pattern variables. Don’t let the terminology and structure make it seem mysterious. Using format-id is convenient as it handles the tedium of converting from syntax to symbol datum to string ... and all the way back. The first argument of format-id, lctx, is the lexical context of the identifier that will be created. You almost never want to supply stx—the overall chunk of syntax that the macro transforms. Instead you want to supply some more-specific bit of syntax, such as an identifier that the user has provided to the macro. In this example, we’re using #'a. The resulting identifier will have the same scope as that which the user provided. This is more likely to behave as the user expects, especially when our macro is composed with other macros. Just as when we used format-id, when using datum->syntax we’re being careful with the first, lctx argument. We want the identifier we create to use the lexical context of an identifier provided to the macro by the user. In this case, the user’s identifiers are in the (names ...) template variable. We change this from one syntax into a list of syntaxes. The first element we use for the lexical context. Then of course we’ll use all the elements to form the hyphenated identifier. You can’t use a pattern variable outside of a template. But you can use syntax or #' on a pattern variable to make an ad hoc, "fun size" template. If you want to munge pattern variables for use in the template, with-syntax is your friend, because it lets you create new pattern variables. Usually you’ll need to use syntax->datum to get the interesting value inside. format-id is convenient for formatting identifier names. Let’s apply what we just learned to a more-realistic example. We’ll pretend that Racket doesn’t already have a struct capability. Fortunately, we can write a macro to provide our own system for defining and using structures. To keep things simple, our structure will be immutable (read-only) and it won’t support inheritance. A constructor procedure whose name is the struct name. We’ll represent structures as a vector. The structure name will be element zero. The fields will be elements one onward. A predicate, whose name is the struct name with ? appended. For each field, an accessor procedure to get its value. These will be named struct-field (the name of the struct, a hyphen, and the field name). ; Define an accessor for each field. expected: (or/c string? symbol? identifier? keyword? char? The error message is not very helpful. It’s coming from format-id, which is a private implementation detail of our macro. Later, we’ll see how syntax-parse makes it even easier to check usage and provide helpful messages about mistakes. The previous two examples used a macro to define functions whose names were made by joining identifiers provided to the macro. This example does the opposite: The identifier given to the macro is split into pieces. ; If the optional ‘default' is missing, use #f.
We’ve started to appreciate that our macros should give helpful messages when used in error. Let’s try to do that here. Not too bad. Of course, the version with error-checking is quite a bit longer. Error-checking code generally tends to obscure the logic, and does here. Fortunately we’ll soon see how syntax-parse can help mitigate that, in much the same way as contracts in normal Racket or types in Typed Racket. Maybe we’re not convinced that writing (hash.refs js.a.b.c) is really clearer than (hash-refs js '(a b c)). Maybe we won’t actually use this approach. But the Racket macro system makes it a possible choice. I stared at racket/splicing for the longest time. What does it do? Why would I use it? Why is it in the Macros section of the reference? This is the classic Lisp/Scheme/Racket idiom sometimes called "let over lambda". A koan about closures and objects. A closure hides y, which can only be accessed via get-y. When there are many body forms—and we’re generating them in a macro—the splicing variations can be much easier. Functions can be used in error. So can macros. With plain old functions, we have several choices how to handle misuse. 1. Don’t check at all. The problem is that the resulting error message will be confusing. Our user thinks they’re calling misuse, but they’re getting an error message from string-append. In this simple example they could probably guess what’s happening, but in most cases they won’t. 2. Write some error handling code. ; function had to work so hard to tell me. Unfortunately the error code tends to overwhelm and/or obscure our function definition. Also, the error message is good but not great. Improving it would require even more error code. ; the function is happier, too. The contract is a simple and concise. Even better, it’s declarative. We say what we want to happen, not how. On the other hand the user of our function gets a very detailed error message. Plus, the message is in a standard, familiar format. Even better, Typed Racket can catch usage mistakes up-front at compile time. For macros, we have similar choices. 1. Ignore the possibility of misuse. This choice is even worse for macros. The default error messages are even less likely to make sense, much less help our user know what to do. 2. Write error-handling code. We saw how much this complicated our macros in our example of Using dot notation for nested hash lookups. And while we’re still learning how to write macros, we especially don’t want more cognitive load and obfuscation. 3. Use syntax-parse. For macros, this is the equivalent of using contracts or types for functions. We can declare that input pattern elements must be certain kinds of things, such as an identifier. Instead of "types", the kinds are referred to as "syntax classes". There are predefined syntax classes, plus we can define our own. November 1, 2012: So here’s the deal. After writing everything up to this point, I sat down to re-read the documentation for syntax-parse. It was...very understandable. I didn’t feel confused. Why? The documentation has a nice Introduction with many simple examples, followed by an Examples section illustrating many real-world scenarios. Update: Furthermore, Ben Greenman has created a package whose docs provide an excellent set of even more Syntax Parse Examples. Furthermore, everything I’d learned up to this point prepared me to appreciate what syntax-parse does, and why. The details of how to use it seem pretty straightforward, so far. This might well be a temporary state of me "not knowing what I don’t know". As I dig in and use it more, maybe I’ll discover something confusing or tricky. If/when I do, I’ll come back here and update this. But for now I’ll focus on improving the previous parts. Eli Barzilay’s blog post, Writing ‘syntax-case’ Macros, helped me understand many key details and concepts, and inspired me to use a "bottom-up" approach. Eli wrote another blog post, Dirty Looking Hygiene, which explains syntax-parameterize. I relied heavily on that, mostly just updating it since his post was written before PLT Scheme was renamed to Racket. Matthew Flatt’s Composable and Compilable Macros: You Want it When? (PDF) explains how Racket handles compile time vs. run time. Chapter 8 of The Scheme Programming Language by Kent Dybvig explains syntax-rules and syntax-case. Fortifying Macros (PDF) is the paper by Ryan Culpepper and Matthias Felleisen introducing syntax-parse. Shriram Krishnamurthi looked at a very early draft and encouraged me to keep going. Sam Tobin-Hochstadt and Robby Findler also encouraged me. Matthew Flatt showed me how to make a Scribble interaction print syntax as "syntax" rather than as "#'". Jay McCarthy helped me catch some mistakes and confusions. Jon Rafkind provided suggestions. Kieron Hardy reported a font issue and some typos. Finally, I noticed something strange. After writing much of this, when I returned to some parts of the Racket documentation, I noticed it had improved since I last read it. Of course, it was the same; I’d changed. It’s interesting how much of what we already know is projected between the lines. My point is, the Racket documentation is very good. The Guide provides helpful examples and tutorials. The Reference is very clear and precise.